It’s a testament to the enduring legacy of The Muppets that their latest film, aptly titled “The Muppets,”can open with Paul Simon’s “Me and Julio Down by the Schoolyard,” and make most of the audience giddy. Before the movie began, there was a trailer for the latest “Alvin and the Chipmunks” movie which involved the chipmunks singing and dancing to Lady Gaga’s “Bad Romance.” It’s things like these that make me thankful that The Muppets are back. Before I delve in to some very deep, fourth-wall-breaking Muppet matters, I’d like to clarify that I am not an aficionado, nor a connoisseur, of Jim Henson’s creation. The Muppets have come in and out of my life in various forms, but I cannot claim to have grown up on them as many have. Having said that, “The Muppets” is a wonderful 90 minutes of holiday escapism. If you think you’re too old for this movie, then I sentence you to a lifetime of watching the new “Alvin and the Chipmunks” trailer on loop. The Muppet gang needs no introduction, but perhaps this movie does. Jason Segel and Nicholas Stoller, the duo responsible for “Forgetting Sarah Marshall” decided to fulfill a lifelong dream and make a movie with The Muppets. That is why “The Muppets” is so heavily nostalgic. Stoller and Segel do add a few new Muppets to the gang, most important of them all being Walter (Peter Linz), who grew up idolizing the Muppets in Smalltown, USA. His brother Gary (Segel), who also happens to be both human and five feet taller than him, is just as obsessed with The Muppets as Walter is. When Gary plans to take his long time girlfriend Mary (Amy Adams) out to Los Angeles for their anniversary, Walter comes along. Along the way, their goal becomes to help Kermit unite the gang for one last show in order to save Muppet Studios from the evil oil man Tex Richman (Chris Cooper). For anyone hoping to fill their children with environmental awareness, this is not the movie for you. Segel’s and Stoller’s choice to make this a self-aware musical is a wise choice, and one that makes this an even more pleasurable viewing experience. I spent a large amount of time learning about the marketing of this movie in my film business class this semester, and for that reason I thought this movie would make me hate both The Muppets and Disney. In actuality, it made me admire both even more. The story of “The Muppets” is truly about the making of itself. 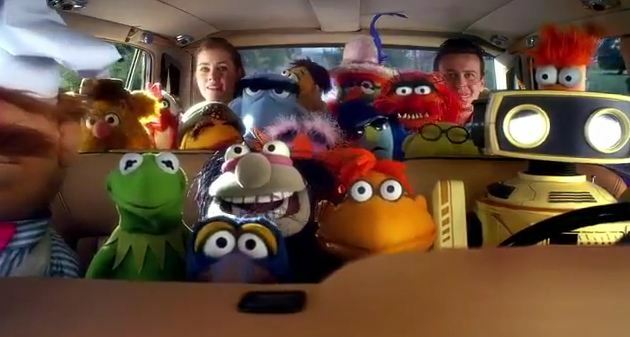 As Walter tries to get The Muppets back together onscreen, the movie does the exact same thing for the audience. Because of this, there are a lot of jokes in the movie that kids probably won’t understand. But for every time a character directly addresses the audience, or makes a joke about the lunacy of the huge dance numbers onscreen, there is a visual gag involving fart shoes. What more could anyone ask for? The Muppets have been known throughout the years for rounding up a variety of celebrities for their shows and movies. This movie is no exception, and I will leave you with the surprise of most of the cameos that occur. I will say though, that “The Muppets” does include a rap by Chris Cooper. Only these puppets could make an Academy Award winner rap. This is a version of The Muppets made largely for those who have been following them since their creation. But then again, isn’t every Muppets product like that? There is no reason that this movie shouldn’t be able to introduce new fans to the characters. Some thought that adding in new characters and the implementation of fart shoes were a desecration of The Muppets. That is an outrage. The Muppets are, and always have been, about the spirit and fun of chaos and anarchy. This entry was posted in Amy Adams, Chris Cooper, James Bobin, Jason Segel, Kermit the Frog, Miss Piggy, Movie Review, The Muppets on November 25, 2011 by ian0592.